Indigo FM’s 2017 Radiothon kicks off this weekend running the whole month of October. There are a slew of fun activities to get involved in as we celebrate the diversity and style of your independent homegrown local radio station Indigo FM. Make sure you head along and like our Facebook Radiothon page fb.me/indigofmradiothon2017 to keep updated with news and Radiothon events. Our Radiothon is your chance to pay your 2018 Membership and in doing so, go in the running for some crackerjack prizes. Membership rates are $12 student/concession, $24 individual/employed, $36 couples, $48 community group and $72 business (1 site), $96 (2 sites) or $120 (3 sites). 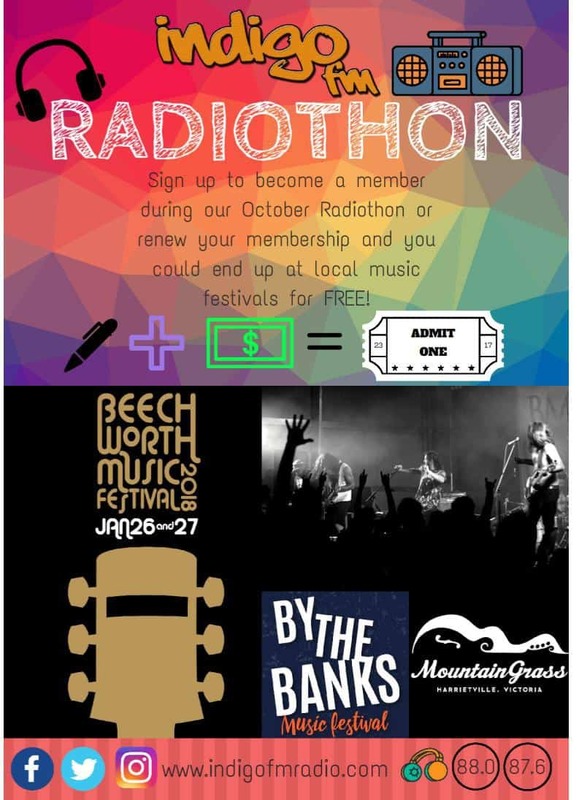 We have awesome prizes on offer including Festival passes for the Beechworth Music Festival (Jan 26-27), Mountaingrass @ Harrietville (Nov 17-19) and By The Banks @ Albury (December 9). Indigo FM’s 2017 Annual General Meeting was held in Chiltern on Thursday 21 September with three new faces among a team of 7 to lead the organisation for the next 12 months. The new faces are Norm Gay, Ian Gracie and Bernie Jovaras. They will join continuing Committee of Management Members Greg Clydesdale, Denis Ginnivan, Scott Landells and Andrea Leonard. The AGM was attended by 13 members – 9 apologies were received. The incoming Committee of Management wishes to thank outgoing members Lex Fletcher, Joanne Le Mura and Alison Williams for their contribution over the past 12 months. The President’s Report can be read here. Committee Member profiles for Scott and Denis can be viewed here. Profiles for Greg, Norm, Andrea, Bernie and Ian will be updated in coming days. You are invited to the 2017 Annual General Meeting of Indigo FM. Venue: Senior Citizen’s Hall, Chiltern. Members wishing to have a meal beforehand should consider doing so at either of the Chiltern evening eateries – Telegraph Hotel, Ironbark Tavern or The Vine. We welcome your attendance and strongly encourage anyone with an interest in helping with the running of Indigo FM to nominate for our Committee of Management. Written nominations on the form linked below may be scanned and emailed to [email protected], [email protected] or mailed to The Secretary, PO Box 64, Chiltern VIC 3683. Nominations may also be lodged at the AGM. Below are links for the Agenda, Minutes from 2016 AGM and also our 2016-17 Statement of Income and Expenditure. Along with election of Committee of Management, these are the only items of business permitted at an AGM as set out in the Model Rules – see page 10 on the link below. Indigo FM has been appointed as lead tenant for the former Beechworth Child and Maternal Health Building. Our local volunteer run radio station recently submitted what turned out to be a successful joint Expression of Interest with BULS – Beechworth Urban Landcare and Sustainability – and along with Beechworth Women’s Shed, the three organisations will partner in the running of the facility. To read the full media release, click here. Indigo FM’s July 2017 Newsletter is out. There is news on upcoming and recent events, activities and happenings both on-air and off-air. Indigo FM has new email accounts we are switching across to on the Gmail platform and there is also a couple of voluntary roles vacant for anyone keen to organise. We also have a link to our first ever live video in the studio! To download the Newsletter pages 1-4 are here and pages 5-8 are here. Do you have an interest in local radio? Indigo FM has a fantastic studio in the Yackandandah Community Centre, and a growing, enthusiastic group of presenters and programs on the airwaves at 88.0 FM in and around Yackandandah. We currently have a vacancy for the voluntary role of Local Site Co-ordinator. If you are interested in this role, take a read of the position description here. For further details please contact [email protected] or speak with Greg on 0448 110 212 or Scott on 0481 267 269. Alternatively you can leave a message on our Facebook page. Expressions of Interest close Friday 28 July. On Friday evening, 21 October we decided to take Rutherglen Indigo FM off the air initially just for 48 hours but now indefinitely. We are seeking a meeting with the licence owner to negotiate a new access agreement, to replace the previous one which expired on 30 June 2015. We are hopeful of commencing discussions regarding such an agreement within the next week or two. In the meantime, we apologise for the disruption this may cause for our local audience, members and the Rutherglen community in general. We have called a meeting for 7pm on Wednesday 9 November at Rutherglen Senior Citizen’s Hall to update Rutherglen members with progress on this matter. All enquiries on this matter can be referred to Scott Landells (President) on 0481 267 269 email [email protected] Alternatively you can speak with Greg Clydesdale (Secretary) on 0448 110 212 or Andrea Leonard (Committee) on 0457 995 563. Thanks for your patience and understanding.